MowtownUSA stocks the lawn mower blades you need for your lawn mowers and lawn tractors. 1) Best Selection - We offer more styles for more lawn mower brands than any one else. 2) Best Price - We buy in large volume and pass the savings on to you, along with volume pricing on blades. 3) Best Quality - Our mower blades are all manufactured from quality materials for a longer lasting cutting edge. Our blades are also precision balanced and heat treated for durability. 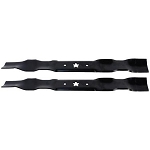 Gator Mulcher Lawn Mower Blades- Gator mulcher lawn mower blades are the best mulcher lawn mower blades offered on the market. First they are flat sharpen surface so it is easy to sharpen the lawn mower blade with a standaed blade grinder. Then you ad the teeth to shred the grass into smaller peices for a better mulch.